nadir Point on the celestial sphere directly below the observer and 180° from the zenith. Nagler eyepiece Telescope eyepiece with a very wide apparent field of view, 80° or more, making it suitable for activities such as searching for comets or novae. The Nagler eyepiece offers excellent eye relief, and is relatively free from aberration, coma and field curvature. It is named after its designer, Al(bert) Nagler (1935-). naked-eye Celestial object visible, or an observation made, without the use of any optical instruments such as a telescope. In theory, stars down to sixth magnitude should be visible to the naked eye under perfect conditions but this is rarely achieved. Nakhla meteorite that fell as a shower of around 40 stones over the El Nakhla el Baharia village in Alexandria, Egypt, in 1911 June; approximately 10 kg of material was recovered. The legend that one of the stones of Nakhla struck and killed a dog is almost totally without foundation. Nakhla is the type specimen of the nakhlites, one of the main subgroups of the martian meteorites (SNCs). Nakhlites are almost unshocked clinopyroxene-rich cumulate rocks. They formed at or near the Martian surface in a thick flow or sill. They have crystallization ages of c.1.3 billion years. Their secondary minerals (clays, carbonates, and sulphates) are tracers of low temperature aqueous processes and can be used to infer conditions on the Martian surface. NaI detector Crystals that produce a flash of visible light (scintillation) when hit by gamma rays. NaI detectors were used in the BATSE instrument on the compton gamma ray observatory to detect gammaray bursts. Nancay Radio Telescope Large transit-type radio telescope at the Nancay Radio Observatory, 200 km (125 mi) south of Paris and operated by paris observatory. It has a fixed spherical reflector 300 x 35 m (985 x 115 ft) fed by a tiltable flat reflector 200 x 40 m (655 x 130 ft). nanometre (symbol nm) Unit of length equivalent to one thousand millionth (10~9) of a metre. The nanometre is commonly used as a measurement of the wavelength of electromagnetic radiation, having replaced the previously used angstrom unit. Naos The star Ј Puppis, visual mag. 2.21, distance about 1400 l.y. Its spectral type is O5 Ia, which makes it the hottest naked-eye star - its surface temperature is estimated to be around 40,000 K. The name is Greek for 'ship'. Narlikar, Jayant Vishnu (1938- ) Indian cosmologist whose research has often explored alternative cosmological models, including the steady-state theory originated by Fred hoyle. Narlikar was educated at Cambridge University, where Hoyle was his advisor; later, they collaborated on a theory of 'self-gravitating systems' that explains the formation of astronomical objects ranging in size from a few kilometres to about 1 million l.y. Narlikar proposed a 'quasi-steady-state' model that takes into account recent findings on the anisotropic distribution of matter in space. As head of India's Inter-University Centre for Astronomy & Astrophysics, he has investigated black holes and the hypothetical particles known as tachyons. 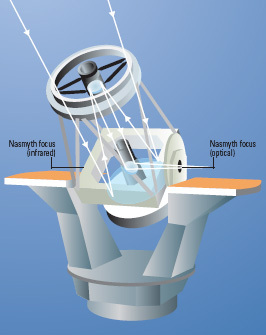 Nasmyth focus A number of large, professional telescopes have instruments at their Nasmyth foci. In the William Herschel Telescope there are two foci, one used for infrared and the other for optical observations. They are sited at opposite ends of the declination axis, and the third mirror (the Nasmyth flat) can be moved to direct light to either of them. National Aeronautics and Space Administration (NASA) US national aeronautics and space agency, with overarching responsibility for American civilian aerospace exploration and associated scientific and technological research. NASA was created in 1958, following the USSR's success with sputnik, and inherited the work of the National Advisory Committee for Aeronautics (NACA) and other government organizations. It began working almost immediately on human spaceflight, and managed the successful mercury and gemini projects before embarking on the apollo lunar landing programme. After the skylab missions and the joint Apollo-Soyuz Test Project in the 1970s came the space shuttle programme, starting in 1981, and today's international space station. NASA's unmanned space projects are no less well known. Scientific probes such as pioneer, voyager, viking, mars pathfinder and mars global surveyor have explored the planets, while orbiting observatories such as the hubble space telescope and the chandra x-ray observatory have sharpened our view of the Universe. The agency has also managed landmark projects in communications and terrestrial remote sensing. The headquarters of NASA are in Washington, D.C., and the agency operates a large number of specialist facilities. They include the ames research center, the glenn research center, the goddard space flight center, the jet propulsion laboratory, the johnson space center, the kennedy space center, the langley research center and facilities such as the Hugh L. Dryden Flight Research Center, the Marshall Space Flight Center and the White Sands Test Facility. NASA also maintains a number of data centres and databases. Taken together, the remit of these facilities covers almost the full gamut of human scientific and technological endeavour. NASA itself has experienced periodic crises of confidence, ranging from the challenger disaster in 1986 to the loss of Mars Climate Orbiter in 1999. The agency has always responded by revising its policies and systems accordingly, and it is fair to say that it retains the enthusiastic support of most American taxpayers. National Astronomical Observatory of Japan (NAOJ) Principal research institute for astronomy in Japan, with headquarters in the Tokyo suburb of Mitaka. The NAOJ was created in 1988 by amalgamating the Tokyo Astronomical Observatory of the University of Tokyo with two other research institutions. Its biggest optical telescope then was the 1.88-m (74-in.) reflector of the Okayama Astrophysical Observatory on Mount Chikurin-Ji (elevation 372 m, 1220 ft) in south-western Okayama, opened in 1960. Today, the NOAJ operates the 8.2-m (320-in.) subaru telescope in Hawaii. Its Radio Astronomy Division operates the nobeyama radio observatory. National Optical Astronomy Observatory (NOAO) Organization formed in 1982 to bring all US ground-based optical observatories managed by the association of universities for research in astronomy (AURA) under a single directorship. Initially, the NOAO's facilities consisted of kitt peak national observatory (KPNO), cerro tololo inter-american observatory (CTIO), and the national solar observatory (NSO). Today, they also include the United States Gemini Program (USGP) - the gateway to the gemini observatory for the US astronomical community. The NOAO is funded by the National Science Foundation and operated by AURA. Its headquarters are in Tucson, Arizona. near-Earth asteroid The inner Solar System is swarming with small, rocky bodies. Asteroids with Apollo- and Aten-type orbits (Earth-crossing) are shown in amber and Amor-type asteroids are shown as red lines. National Radio Astronomy Observatory (NRAO) Research facility of the US National Science Foundation providing radio telescope facilities for the astronomical community. The NRAO was founded in 1956, and has its headquarters in Charlottesville, Virginia. Its newest instrument is the atacama large millimeter array; it also operates the very large array, the very long baseline array, and the telescopes of green bank observatory. Other facilities include one of the four NASA tracking stations (also at Green Bank) for the Very Large Baseline Interferometry Satellites. National Solar Observatory (NSO) Principal US organization for solar astronomy. Its instruments include the mcmath-pierce solar telescope at kitt peak national observatory, and it also operates telescopes at Sacramento Peak, New Mexico. The NSO is a facility of the national optical astronomy observatory, and has headquarters in Tucson, Arizona. National Space Development Agency of Japan (NASDA) Japan's space agency, established in 1969 as an umbrella organization for the nation's space activities and to promote the peaceful use of space. NASDA has developed and flown its own spacecraft and launch vehicles, and also participates in collaborative ventures with other countries. It is a partner in the international space station, and Japanese astronauts have flown aboard the space shuttle. native American astronomy Astronomy as practised in pre-Columbian America, until its cultures were eradicated by European invaders. The most advanced astronomy, of comparable sophistication to anything the Old World could offer despite their complete isolation from Europe and Asia, was possessed by the Maya of Central America, whose empire spread from the Yucatan Peninsula to cover other parts of modern Mexico, Guatemala and Belize and was at its height c.ad 300-900. Significantly, the Maya also had the best-developed mathematics in the New World. Some knowledge of their astronomy comes from a 'bark book' known as the Dresden Codex, written in hieroglyphics. Like most other indigenous American cultures, the Maya placed great importance on the motions of Venus and the Pleiades. The Maya had an intricate system of interlocking calendars. One was based on a year of 365 days, with 18 months of 20 days each (20 was the base of their number-system) and a special period of five 'unlucky' days. Another 'year' was based on 360 days and a third sacred year had 260 days with 13 subdivisions of 20 named days each. An almanac in the Dresden Codex covers the cycles of its apparent revolutions with great precision. They also had some knowledge of the cycle of solar eclipses, though they were not able to predict their actual occurrence with certainty, only being able to give days on which eclipses might occur. There is evidence of astronomy having been practised by other American cultures, though none reached the heights of the Mayan. Extensive systems of lines centred on the Inca Temple of the Sun display astronomical alignments, and huge pre-Inca figures marked in the desert at Nazca have some astronomical significance. Many other structures in South, Central and North America - for example the Medicine Wheel stone circle in Wyoming - also display astronomical alignments. The Aztecs' astronomy was largely bound up with ritual and sacrifice. In common with other city-cultures, including the Maya and the Toltec, they pictured a layered comos, the Earth occupying the lowest level and the creator the uppermost. navigational astronomy Use of astronomical observations to determine the geographical position of a vessel at sea or an aircraft. It is now largely of historical interest thanks to the global positioning system (GPS) of navigational satellites. The need for celestial navigation arose with the ever-increasing distances travelled by European seafarers from the 15th century onwards. Latitude was easy enough to determine by observing the altitude of Polaris (or that of the Sun) and consulting tables giving its declination for a given date. Simple instruments such as the cross-staff, quadrant and astrolabe were used for this purpose. The determination of longitude depended on having accurate time available. Various methods, such as tables of the Moon's position among the stars or observations of Jupiter's satellites, were proposed for determining time at sea. However, they depended on the ability to predict positions with sufficient accuracy. An additional difficulty was that the observations required for comparison with positions in the tables were by no means easy to make on a rolling and pitching ship. The development of the marine chronometer in the 18th century and the annual publication of The Nautical Almanac in Britain from 1766 eventually made possible the determination of longitude at sea. Time signals derived from transit observations were provided at various ports so that chronometers could be accurately set and checked. Radio time signals became common in the 1920s and 1930s, thus removing the need for independent timekeeping except at times of war; navigators on naval ships and military aircraft received training in 'astronavigation'. Further developments based on radio techniques were the Loran, Decca and Omega systems, which involved (in essence) timing the radio transmissions from fixed transmitters, multiplying by the speed of light to get the distances and plotting the result on a chart to get the position. neap tide Low-level high tides that occur when the directions of the Sun and Moon are at a right angle. NEAR Abbreviation for Near Earth Asteroid Rendezvous spacecraft, later known as near shoemaker. near-Earth object (NEO) asteroid or comet with an orbit that brings it close to the orbit of the Earth. By analogy with the classes of orbit that comprise the near-earth asteroids, the criterion for an NEO is that the perihelion distance be less than 1.3 AU. It is usual, though, to regard NEOs as including only those objects with smaller perihelia, making very close approaches to the Earth (and possibly impacts) feasible in the near term. NEAR Shoemaker First spacecraft to orbit and land on an asteroid, eros, in 2000 February and 2001 February respectively. The Near Earth Asteroid Rendezvous (NEAR) spacecraft was also the first in NASA's discovery programme series to be launched, in 1996 February. The craft was renamed NEAR Shoemaker in honour of the astrogeologist Gene Shoemaker, who was killed in an accident while the spacecraft was en route. NEAR flew past the asteroid mathilde in 1997 June and made a gravity assist flyby of the Earth in 1998 January, setting itself up for the rendezvous with Eros. The first attempt to enter orbit in 1999 January was thwarted by an engine fault, but ingenious troubleshooting enabled a second attempt to be made in 2000 February. NEAR surveyed Eros and returned a wealth of data, including close-up images of the surface. Scientists and mission controllers arranged a spectacular finale to the mission, guiding the craft to a controlled touchdown on the surface in 2001 February. This originally unscheduled manoeuvre was a surprising success. near-ultraviolet Region of the electromagnetic spectrum between around 380 and 310 nm, which can be observed from the ground but is not visible to the naked eye. NEAT Acronym for Near-Earth Asteroid Tracking, an asteroid research programme based at the jet propulsion laboratory in Pasadena, California, USA. Several comets discovered in this project have been given the name NEAT. nebula Celestial object that appears larger and fuzzier than a star. Originally the term was used for any such object, but it is now restricted to those objects that are clouds of gas and dust and so cannot be resolved into stars. Most emission nebulae emit their light in a series of emission lines. In these nebulae the atoms are ionized by ultraviolet radiation from a hot star or stars, and the visible light is emitted as the electrons are recaptured. Hydrogen is the most abundant element in almost all nebulae, and because it is ionized such nebulae are called hii regions. Hydrogen gives off its strongest light in the red at 656 nm, thus HII regions often appear red on images; however, they can appear greenish when seen visually because of a prominent pair of forbidden lines at 496 and 501 nm emitted by oxygen. If the star exciting an emission nebula is very hot, such that most of its radiation is in the ultraviolet, the nebula can appear much brighter than the star, since it processes the ultraviolet radiation to visible light. Although looking bright and almost solid, emission nebulae are very tenuous. Typically every kilogram of material is spread over a volume of a thousand million cubic kilometres. Nebulae that are supernova remnants often emit synchrotron radiation; this is usually in the radio region, but in a few cases, like the crab nebula, it can extend into the visible. Some nebulae are seen because they scatter starlight. In this case we see not the gas itself but the myriad tiny motes of dust that normally are mixed with it. The dust is lit up like smoke in sunlight. These reflection nebulae are always fainter than the star that illuminates them, unless a denser portion of the nebula hides the star from us. Reflection nebulae generally appear blue on images. nebular hypothesis Theory that the Solar System was formed from nebulous material in space. In 1755 the philosopher Immanuel kant published his Universal Natural History and Theory of the Heavens, in which he suggested that the Sun and planets condensed out of diffuse primordial matter under the attraction of gravity. A similar theory was developed independently and in greater detail by Pierre Simon laplace in his Exposition du systeme du monde (1796). He envisioned that the Sun originally had an extended hot atmosphere throughout the volume of the Solar System. As this cooled and contracted, it spun more rapidly and threw off a series of gaseous rings; the planets condensed from this material. A similar process on a smaller scale supposedly produced satellites from contracting planets. nebular variable variable star associated with nebulosity. The most important are the fu orionis star and the ttauri star classes. These are very young stars that have started to shine but have not yet reached the main sequence. They are believed to represent the last stage in the development of protostars, before they settle down on the main sequence. The T Tauri stars (classified as INT) vary irregularly in brightness, whereas the FU Orionis stars (FU) exhibit a single brightening, possibly as they assume a stable state. Nebular variables are F-, G- or K-type giant stars, many still surrounded by warm cocoons of dust and gas. There are a great number in the ORION NEBULA. While contracting, nebular variables probably lose large amounts of material in the form of a stellar or T-Tauri wind. The rate of mass loss is about one-ten millionth of a solar mass per year. Such stars are also rotating very rapidly, throwing off material at speeds of up to 300 km/s (180 mi/s). Subclasses of the nebular variables are named after their prototype stars -YY Orionis (extremely young), T ORIONIS and RW AURIGAE. The UVN subtype of FLARE STAR is also sometimes considered to be a nebular variable. nebulium Hypothetical element once thought to exist in planetary and diffuse nebulae in order to explain unidentified green emission lines at 500.7 and 495.9 nm (as well as others later found). The nebulium lines were later discovered to be FORBIDDEN LINES of various ionization states of oxygen, nitrogen, neon and other atoms (the 500.7 and 495.9 nm lines coming from doubly ionized oxygen [OIII]). Nectaris, Mare (Sea of Nectar) Lunar lava plain, roughly 290 km (180 mi) in diameter, located in the south-east quadrant of the Moon. This region was struck by an enormous object, producing a multi-ring impact BASIN. Basalts later flooded the inner regions. The outer basin ring is deeply eroded, but is still visible in the southwest as Rupes ALTAI. A prominent dark-haloed crater has excavated the dark lava in the western region. The basin's EJECTA scours the Moon to the south, producing the Janssen formation, including Vallis Rheita. Neptune Eighth planet from the Sun. It is the fourth largest (by diameter) and the third most massive planet. From 1979 to 1999 PLUTO, thanks to its eccentric orbit, was nearer to the Sun than Neptune: during this period Neptune was thus the ninth and farthest known planet. 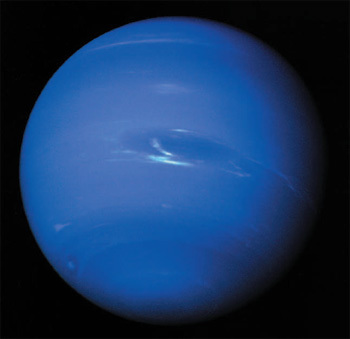 Neptune Neptune appears bluish because methane in its atmosphere absorbs red light. Ice particles in its upper cloud decks also scatter blue light. At magnitude +7.8, Neptune is too faint to be seen with the unaided eye, and its discovery awaited the invention of the telescope. After URANUS was discovered by William HERSCHEL in 1781, its orbit was calculated in order to follow the planet's motion. Before about 1820, however, Uranus was found to get ahead of its predicted position and after this to lag behind. It was suggested that this anomaly was a result of the gravitational influence of a unknown planet orbiting farther from the Sun. From observed irregularities in the motion of Uranus, the mathematicians John Couch ADAMS,working in England, and Urbain LE VERRIER,working independently in France, both predicted the location of the unseen planet. A comedy of errors and ineptitude prevented English astronomers following up Adams' predictions, and it was Le Verrier who eventually persuaded the German astronomer Johann GALLE in Berlin to search the region of the sky in which he had calculated that the new planet would lie. On 1846 September 23, Galle and his student, Heinrich D'ARREST, located the new planet very close to the predicted position. Scholars have largely given joint credit for the discovery to Adams and Le Verrier because their predictions were based on a sound analysis of data and a thorough knowledge of gravitational theory. At least, this was the situation for 134 years. 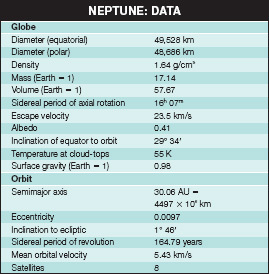 In 1980, however, the astronomical world was astonished when an astronomer and Galileo scholar announced that Galileo himself had first seen Neptune with his telescope in 1613 January, some 233 years before it was identified by Galle. It was not recognized as a planet: Galileo's sketches showed its apparent motion, but his interest was concentrated on Jupiter and the satellites and so the discovery was delayed. Although Neptune is sometimes described as a 'jovian' planet, its resemblance to JUPITER and SATURN is superficial. Neptune is, however, quite similar to Uranus in many ways, including diameter, composition and mass. Seen through the telescope, both planets are nearly featureless, in strong contrast to the abundant cloud structures on Jupiter and the banded appearance of SatThe atmosphere of Neptune shows faint bands rather like those of Jupiter and Saturn. The bands are not easily seen from Earth as the planet appears so small. subtending only 2".5. The planet is composed mainly of molecular hydrogen and helium. with a small silicate and metallic core. The atmosphere is primarily methane and other hydrocarbons. During its 1989 encounter, VOYAGER 2 identified several dark spots, the largest of which was called the 'Great Dark Spot', though recent images from the Hubble Space Telescope show that it has now disappeared. There was also a bright, fast-moving spot, referred to as the 'Scooter'. Whether these spots have dissipated or faded is not known. Also identified were bands of light-coloured cirrus cloud, which from the shadows cast appeared to be some 50-100 km (30-60 mi) higher than the tops of the main cloud belts. The overall haziness of the atmosphere may be anti-correlated with the sunspot cycle, in that at times of maximum solar activity Neptune appears in our telescopes to be a little fainter than average, while at sunspot minimum it is brighter. The Sun's activity thus appears to influence the atmosphere of Neptune, some 4500 million km (2800 million mi) away, by the formation of a global haze affecting the apparent brightness of the planet as seen from Earth. However, a recent analysis of brightness observations of Neptune and also Uranus does not support this view in the long term. 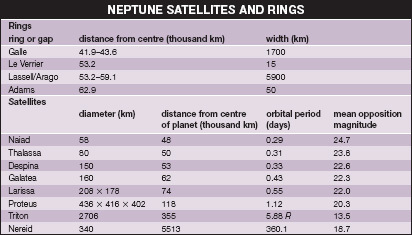 Neptune Among Neptune’s eight known satellites are some of the largest planetary satellites. Triton, which was discovered only a few days after the planet itself, orbits in a retrograde direction. Nereid is farther out has a highly elliptical orbit. The other six satellites are all closer to the planet than Triton. Being a GAS GIANT, Neptune has only a small solid core, which is thought to be of silicon, iron and other metals. The bulk of the planet is largely composed of hydrogen and helium, which under the temperature and pressure act as supercooled liquids. Neptune's mean density is 1.64 g/cm3, which is somewhat higher than the other gas giants. Convection currents in the mantle carry heat up from the core region. As Neptune continues to contract, because of its own strong gravitational field, and as the constituents of the mantle gradually differentiate, with the heavier molecules settling to the bottom, energy is liberated from the planet. This energy is emitted as excess heat. The temperature in the stratosphere at the 100 mbar pressure level was measured to be 55 K, though the temperature predicted on the basis of Neptune's distance from the Sun and other parameters is a few degrees cooler. Voyager 2 also identified a weak magnetic field, inclined at 47° to the rotation axis, radio emissions, aurorae and radiation belts. Neptune In 1989 Voyager 2 imaged Neptune’s rings. The material in them is unevenly distributed, leading to an observed ‘clumpy’ structure. Neptune has eight known satellites, the brightest of which, TRITON, was discovered by William LASSELL shortly after Neptune's discovery was announced. The others are much fainter. Nereid was discovered in 1949, with a further six identified during Voyager's flyby. 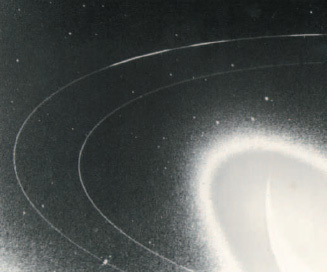 Analysis of observations during stellar occultations by Neptune suggested that several ring arcs surrounded the planet, and Voyager 2 imaged several rings of varying intensity. Four obvious rings were detected, with ring particles found in much of the space in between. Neptune The blue planet’s atmosphere has many features, including this highlevel cirrus. 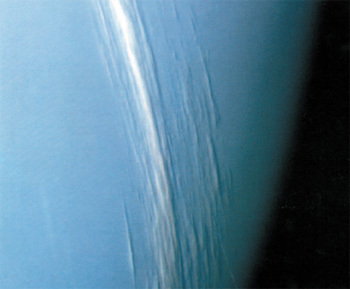 Most atmospheric structures on Neptune, such as the Great Dark Spot, appear to be short-lived. Nereid Second satellite of NEPTUNE to be discovered, by Gerard Kuiper in 1949. It is about 340 km (210 mi) in size. Despite being slightly smaller than PROTEUS, Nereid was discovered telescopically long before any of the inner Neptunian satellites were spotted (in VOYAGER 2 images), because of its much greater distance from the glare of the planet. Nereid takes 360 days to orbit Neptune, at an average distance of 5.51 million km (3.42 million mi) from the planet's centre. It has an unusual orbit, with a low inclination (near 7°) and the highest eccentricity of all known planetary satellites (0.751), indicating that Nereid is likely a captured body, previously a CENTAUR or a TRANS-NEPTUNIAN OBJECT. neutral point Position between two bodies where their gravitational pulls are equal in strength; the neutral point is closer to the less massive body. 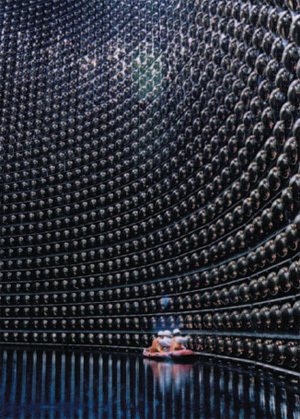 neutrino astronomy Study of bodies in the Universe via their emission of neutrinos. The neutrino is an electrically neutral subatomic particle whose existence was first suggested in 1930 by the Austrian physicist Wolfgang Pauli (1900-1958) in order to account for the apparent non-conservation of energy in P-decays. The neutrino was required to take away a varying amount of excess energy during the reactions in an (almost) undetectable manner, so that the total energy released remained constant. The neutrino was discovered experimentally in 1955 by the American physicists Clyde Cowan Jnr (1919- ) and Frederick Reines (1918- ). Its interaction with other forms of matter is indeed weak: of all the neutrinos produced at the centre of the Sun, 99.99% escape without any contact with other particles during their 700,000 km (400,000 mi) journey to the Sun's surface. There are now known to be three varieties of neutrino, together with their antiparticles. The original neutrino is associated with normal electrons and is called the electron-neutrino. The other two neutrinos are associated with the heavy electrons (leptons) known as muons and tau particles and so are named muon-neutrinos and tau-neutrinos. It has recently been shown experimentally that one type of neutrino can metamorphose into another. This is of great significance for the SOLAR NEUTRINO problem and also implies that neutrinos have a mass, albeit perhaps only a millionth that of a normal electron. neutrino astronomy When operating, neutrino detectors such as the Super-Kamiokande in Japan contain exceptionally pure water. Because neutrinos themselves are so difficult to detect most instruments search instead for radiation and decay particles resulting from collisions between the neutrinos and atoms in the water. Neutrinos from space are detected in two main ways, either through their taking part in nuclear reactions, or by their collisions with other particles. The first detector started operating in 1968 and continues to this day. Devised by the American chemist Raymond Davis, Jr (1916- ), it operates by detecting the radioactive decay of argon-37. The argon-37 is produced by a neutrino interacting with chlorine-37, and so each decay corresponds to a neutrino capture. The detector is a tank containing 600 tonnes of tetrachloroethene; it is buried 1.5 km (0.9 mi) below ground at the HOMESTAKE MINE in Dakota in order to shield it from unwanted interactions. Two other detectors, SAGE (in the Caucasus) and GALLEX (in Italy), detect neutrinos in a similar fashion, but based upon the conversion by a neutrino of gallium-71 to radioactive germani-um-71. The second class of detectors operates by detecting the (CERENKOV RADIATION from high energy electrons in water. The electrons result either from inverse beta decay, in which a neutrino and proton convert to a neutron and positron (positive electron), or gain their energy by direct collision between the neutrino and an electron. The water for this class of detectors is either contained in large tanks buried underground, as at IMB (the Irvine Michigan Brookhaven experiment) in the USA, Super-Kamiokande in Japan and SNO (Sudbury Neutrino Observatory) in Canada; or is a part of the ocean, for example DUMAND (Deep Undersea Muon and Neutrino Detection) in the Pacific Ocean and NESTOR in the Mediterranean Sea; or is part of the Antarctic icecap, for example the Antarctic Muon and Neutrino Detector Array (AMANDA). Neutrinos are expected to be produced in many reactions, but to date have only been detected from three astronomical sources. The first is from the core of the Sun, where two neutrinos result from the formation of a helium nucleus (see NUCLEOSYNTHESIS); the second is from the 1987 SUPERNOVA in the Large Magellanic Cloud; and the third is as a result of COSMIC RAY interactions with nuclei at the top of the Earth's atmosphere. The potential importance of neutrinos, however, lies in their ability to allow us to 'see' directly what is happening at the centres of stars, and in providing information on the Universe that is independent of ELECTROMAGNETIC RADIATION. neutron Electrically neutral subatomic particle that along with the PROTON forms the nuclei of atoms. The British physicist Sir James Chadwick (1891-1974) discovered the neutron in 1932. Inside a nucleus it is stable, but as an independent particle it decays with a half-life of about 12 minutes to a proton, electron and anti-neutrino. Its mass is 1.674929 X 1CT27 kg (1.008793 amu). neutron star Densest and tiniest star known, composed of DEGENERATE MATTER and supported by neutron degeneracy pressure. Neutron stars are the end points of stars whose mass after nuclear burning is greater than the CHANDRASEKHAR LIMIT for white dwarfs, but whose mass is not great enough to overcome the neutron degeneracy pressure to become BLACK HOLES. The neutron, which along with the proton makes up the atomic nucleus, was discovered in 1932. At the end of 1933 Walter BAADE and Fritz ZWICKY tentatively suggested that in SUPERNOVA explosions, ordinary stars are turned into stars that consist of extremely closely packed neutrons. They called these stars neutron stars. neutron star A hot X-ray source within the supernova remnant IC443 is thought to be the neutron star created in the explosion. Measurements of its movement through the nebula have led to the conclusion that light from the supernova reached Earth some 30,000 years ago. Neutron stars were thought to be too faint to be detectable and little work was done on them until 1967 November, when Franco Pacini (1939- ) pointed out that if the neutron stars were spinning and had large magnetic fields, then electromagnetic waves would be emitted. Unbeknown to him, radio astronomer Antony HEWISH and his research assistant Jocelyn Bell (see BELL BURNELL) at Cambridge were shortly to detect radio pulses from stars that are now believed to be highly magnetized, rapidly spinning neutron stars, known as PULSARS. Any star with an initial main-sequence mass of around 10 solar masses or above has the potential to become a neutron star. As the star evolves away from the main sequence, subsequent nuclear burning produces an iron rich core. When all nuclear fuel in the core has been exhausted, the core must be supported by degeneracy pressure alone. Further deposits of material from shell burning cause the core to exceed the Chandrasekhar limit. Electron degeneracy pressure is overcome and the core collapses further, sending temperatures soaring to over 5 billion K. At these temperatures, photodisintegration (the breaking up of iron nuclei into alpha particles by high-energy gamma rays) occurs. As the temperature climbs even higher, electrons and protons combine to form neutrons, releasing a flood of neutrinos. When densities reach nuclear density of 4 X 1017 kg/m3, neutron degeneracy pressure halts the contraction. The infalling outer atmosphere of the star is flung outwards and it becomes a Type II or Type Ib supernova. The remnant left is a neutron star. If it has a mass greater than about 2-3 solar masses, it collapses further to become a BLACK HOLE. Other neutron stars are formed within CLOSE BINARIES. The surface of the neutron star is made of iron. In the presence of a strong magnetic field the atoms of iron polymerize. The polymers pack to form a lattice with density about ten thousand times that of terrestrial iron and strength a million times that of steel. It has excellent electrical conductivity along the direction of the magnetic field, but is a good insulator perpendicular to this direction. Immediately beneath this surface the neutron star is still solid, but its composition is changing. Larger nuclei, particularly rich in neutrons, are formed, and materials that on Earth would be radioactive are stable in this environment, for example nickel-62. With increasing depth the density rises. When it reaches 400 thousand million times that of water the nuclei can get no larger and neutrons start 'dripping' out. As the density goes up further the nuclei dissolve in a sea of neutrons. The neutron fluid is a superfluid - it has no viscosity and no resistance to flow or movement. Within a few kilometres of the surface the density has reached the density of the atomic nucleus. Up to this point the properties of matter are reasonably well understood, but beyond it understanding becomes increasingly sketchy. The composition of the core of the star is particularly uncertain: it may be liquid or solid; it may consist of other nuclear particles (pions, for example, or hyperons); and there may be another phase change, where QUARKS start 'dripping' out of the neutrons, forming another liquid. A neutron star has a mass comparable to that of the Sun, but as it is only about 10 km (6 mi) in radius, it has an average density 1000 million million times that of water. Such a large mass in such a small volume produces an intense gravitational force: objects weigh 100,000 million times more on the surface of a neutron star than on the surface of the Earth. The intense gravitational field affects light and other electromagnetic radiation emitted by the star, producing significant redshift (z approximately equal to 0.2). The strong gravitational attraction allows neutron stars to spin rapidly (hundreds of revolutions per second) without disintegrating. Such spin rates are expected if the core of the original star collapses without loss of angular momentum. If the original star has a magnetic field, then this too may be conserved and concentrated in the collapse to a neutron star. Pulsars, GAMMA-RAY BURST sources, and the neutron stars in some X-RAY BINARIES are believed to have magnetic fields of strength about 100 million Tesla (roughly a million million times the strength of the Earth's magnetic field). There are thought to be of the order of 108 neutron stars in the Galaxy, but they can only be easily detected in certain instances, such as if they are a pulsar or part of a binary system. Non-rotating and non-accreting neutron stars are virtually undetectable, but the Hubble Space Telescope has observed one thermally radiating neutron star (RX J185635-3754). Its surface temperature is 6 X 105 K and its radius 12-13 km (7.5-8 mi). Neutron star mergers may produce gamma-ray bursts. Newall Telescope Refractor of 0.63 m (25 in.) aperture built by Thomas Cooke & Sons for amateur observer Robert Stirling Newall (1812-89) of Gateshead, England. Completed in 1869, it was for a while the world's largest refractor; it is now in Greece, and is operated by the National Observatory of Athens. Newcomb, Simon (1835-1909) American mathematical astronomer, born in Canada, who calculated highly accurate values for astronomical constants and tables of the motions of the Moon and planets and was the most influential astronomer of his day. In 1861 he became professor of mathematics at the US NAVAL OBSERVATORY (USNO), Washington. Studying the orbits of asteroids, he proved that they could not have originated from the break-up of a single body, a once-popular theory. New-comb began a lifelong study of the Moon's motion. His results suggested that the discrepancy between the Moon's calculated and observed motion was caused by a gradual slowing of the Earth's rotation; this was finally proved by others, including E.W. BROWN. Four years later, Newcomb became superintendent of the US Nautical Almanac Office, where he set about refining the orbits of the planets, using observations dating back to 1750. This was a major feat of celestial mechanics, carried out with the collaboration of E.W. Brown, G.W HILL and others. The work required an accurate value of the SOLAR PARALLAX (it), which Newcomb had begun working towards some years before. To this end he observed the 1874 and 1882 transits of Venus, but decided that ultimately the accuracy of i depended on having an accurate value of c, the speed of light, to measure which he devised a method based on that of Leon FOUCAULT. He also established that the discrepancy between the observed and calculated values of the advance of Mercury's perihelion was 43", exactly the difference later explained by the theory of GENERAL RELATIVITY. Newcomb's planetary tables, published in 1899, remained in use until the 1950s. Equally enduring was his consistent system of refined astronomical constants, cal-culatedjointly with Arthur Matthew Weld Downing (1850-1917) of the UK Nautical Almanac Office, and adopted worldwide in 1901. New General Catalogue (NGC) In full, the New General Catalogue of Nebulae and Clusters of Stars, compiled by J.L.E. DREYER. At the suggestion of the Royal Astronomical Society, Dreyer combined what were then the three main catalogues of nebulae - John HERSCHEL's General Catalogue of Nebulae (which Dreyer had already revised, in 1879), and those of Heinrich D'ARREST and Lord ROSSE; and supplemented the amalgamated listing with more recent observations by a number of other astronomers. The NGC, published in 1888, contains nearly 7840 non-stellar objects (including galaxies, although their real nature was not then known) and over 5000 more are listed in two subsequent index catalogues. Objects are still referred to by their NGC numbers. A revision for the present epoch has been published as NGC 2000.0 (1988). New Technology Telescope (NTT) Innovative 3.6-m (142-in.) telescope at LA SILLA OBSERVATORY, operated by the EUROPEAN SOUTHERN OBSERVATORY. Completed in 1989, the NTT pioneered several aspects of modern telescope design, including the use of ACTIVE OPTICS and ADAPTIVE OPTICS, and is essentially a prototype of the VERY LARGE TELESCOPE. Frequently operated remotely, the instrument had its control system upgraded to VERY LARGE TELESCOPE standards in 1997. It is equipped with spectroscopic and imaging instruments designed to capitalize on its excellent image quality. Newton, Isaac (1642-1727) English physicist and mathematician. Most of his theories - on gravitation, light and calculus, for example - he developed in basic form while in his early twenties. In 1668 he built the first reflecting telescope in order to avoid the chromatic aberration inherent in lenses. In 1684, urged by Edmond Halley, he began work on Principia (1687), in which he put forward his law of gravitation and laws of motion, and showed how gravitation explained Kepler's laws. In his Opticks (1704) he set out his theories of light, including how white light is made up of the colours of the spectrum. Newton's greatest mathematical achievement was his invention of calculus. Born prematurely at Woolsthorpe, a hamlet near Grantham, Lincolnshire, three months after his father's death, Newton was left in the care of his grandmother, during which time his mother married again. Hating his stepfather, Newton suffered all his life from a sense of insecurity; it was this that later in life made him abnormally sensitive to criticism of his scientific work. When his stepfather died, Newton's mother determined that he should become a farmer and manage her estates, but he showed no interest in such a career, and she was persuaded to allow him to be prepared for university. In 1661 Newton entered Trinity College, Cambridge, as a subsizar - an impoverished undergraduate who performed menial tasks to help pay for his keep. Newton graduated in 1665 April, having already invented his mathematical method of fluxions, though few people were aware of the fact. However, the university was then closed because of the plague and the scholars dispersed. Newton went back to Woolsthorpe where, except for a return for a couple of months to Cambridge, he consolidated his mathematical work and his nascent optical theory of the nature of colour. He also recognized that each planet was held in its orbit by a force emanating from the Sun which diminished according to the square of its distance - an inverse-square law. But he published nothing. Society in London at their request, and Newton was promptly elected a Fellow. At his own suggestion he then submitted a paper on his theory of light and colour. This historic paper was criticized, and the ensuing controversy severely upset him, though in 1675 he did submit two other optical papers. One was about the colours seen in very thin films of oil and other materials, the other on his theory that light was composed of tiny particles, or 'corpuscles'. These also caused controversy, and in the end, Newton shut himself away in Cambridge and shunned further publication. Not until late in 1679 did his resume correspondence, with Robert Hooke, Honorary Secretary to the Royal Society and previously a severe critic of Newton's theories of light and colour. An exchange of letters led Newton to re-examine his work on planetary orbits, but again he published nothing; not until 1684 was he stimulated to consider making his ideas known. This was the result of a visit from Edmond halley. In London, Halley had been discussing the problem with Hooke and with the astronomer-architect Christopher Wren (1632-1723). No one had been able prove mathematically that an inverse-square law would result in elliptical planetary orbits, and Halley decided to visit Newton and ask him whether he knew the reason. Newton replied that he did, and had a mathematical proof. Unable to locate it among his papers, he promised to convey it to Halley later. This he did, sending a small tract with the title De motu ('On Motion'). When Halley received it, he was mathematician enough to realize that here was a document of the greatest significance. He therefore prevailed on the Royal Society to publish an entire book on the subject by Newton, and also persuaded Newton to continue expanding his ideas for publication. There were difficulties, however. On the one hand the Royal Society was short of money and could not afford to publish; Halley himself had to edit the manuscript and pay the printer out of his own pocket. On the other hand, Hooke raised objections, claiming that Newton had stolen his results. Newton was furious - he went through his text deleting nearly every reference to Hooke, and refused to complete the book. It took all of Halley's undoubted diplomatic gifts to save the situation, and at last, in 1687 July, the volume appeared with the title Philosophiae naturalis principia mathematica ('The Mathematical Principles of Natural Philosophy'). The book, known by its shortened name, principia, was a tour de force, one of the most important scientific works ever written. It not only solved virtually all the questions and problems of traditional astronomy, but stimulated a vast amount of further research. Newton was exhausted after this vast intellectual effort, and seems to have suffered a nervous breakdown. He withheld publication of his Opticks and his acceptance of the presidency of the Royal Society until after Hooke's death, and did no more major scientific work. Thereafter he spent his time researching biblical chronology and practising alchemy, as well as seeking public preferment. He was appointed Warden of the Mint in 1696 to take charge of a great recoinage scheme; later he became Master of the Mint. This work he carried out with outstanding ability, and was knighted in 1705 in recognition of his exceptional service. Newton's later years were darkened by two major controversies. The first was over the publication of the observations of John flamsteed, which he persuaded Halley to edit; the other was a priority dispute over the invention of calculus. Newton had expanded his fluxions into the technique now known to have been discovered independently by Gottfried Wilhelm Leibniz (1646-1716). Newton was encouraged by others to accuse Leibniz of stealing his ideas, and the controversy became very bitter, pursued even after Leibniz's death. By the end of his life not only was Newton considered the doyen of British science, but his reputation had become international. He died on 1727 March 20 in London, and was buried in Westminster Abbey following a state funeral. His achievements were so important for astronomy that the phrase 'Newtonian revolution' is often used. Indeed, his influence on the physical sciences was profound and long-lasting: physics was Newtonian physics until the arrival of relativity and quantum physics. Newton European Space Agency (ESA) X-Ray Multi-Mirror (XMM) telescope launched in 1999 December as the second Cornerstone Horizon 2000 science mission. Newton carries high-throughput X-ray telescopes with an unprecedented effective area and an optical monitor, the first flown on an X-ray observatory. The large collecting area and ability to make long uninterrupted exposures provide highly sensitive observations. Newtonian telescope reflecting telescope having a paraboloidal primary mirror, and a diagonal plane mirror positioned to divert the light path through 90° to a focus near the side and towards the upper end of the telescope tube. For apertures less than 150 mm (6 in. ), simpler spheroidal primaries can be used without significant loss of optical performance. Before the rise of the Schmidt-Cassegrain telescope, the Newtonian was the reflector of choice for many amateur observers. 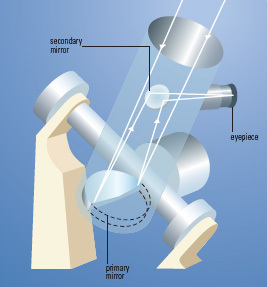 Newtonian telescope In this form of reflecting telescope, light is reflected from a parabaloidal primary mirror to a flat secondary mirror (or sometimes a prism), placed diagonally within the tube, and directed to a sidemounted eyepiece. The resulting image is inverted. Newton's law of gravitation Law governing the mutual attraction between two masses that arises from the gravitational force. In his Principia, published in 1687, Sir Isaac newton announced that the force of gravity between any two masses, m1 and m2, is proportional to the product of their masses and inversely proportional to the square of the distance, r, between them. Although gravity is the weakest of the four forces (the others being the strong and weak nuclear forces and the electromagnetic force), it operates at long range and there are no negative masses to counter-balance the effect of normal mass (in the way that positive and negative electric charges cancel out each others' effects). Gravity is, therefore, the dominant force governing large scale phenomena within the Universe. It determines, amongst many other things, the shapes and sizes of satellites, planets and stars, the nature of their orbits, the shapes of galaxies and clusters of galaxies and their interactions. Newton's laws of motion Laws governing the movement of bodies proposed by Sir Isaac newton in his Philosophiae naturalis principia mathematica ('The mathematical principles of natural philosophy', usually known as the Principia), which was published in 1687. The laws are: (1) A body continues in a state of rest or uniform motion in a straight line unless acted upon by an external force; (2) The acceleration of a body is proportional to the force acting on it, and the constant of proportionality is called the mass of the body; (3) For every force there is an equal and opposite force, called the reaction, acting on the body providing the force. Next Generation Space Telescope (NGST) International successor to the hubble space telescope. The US$2 billion NGST will be an 8-m (26-ft) class instrument combining visible and infrared astronomy. It will orbit at the L2 Lagrangian point between the Earth and the Sun, 1.5 million km (0.9 million mi) from the Earth. NGST will be launched after 2010 following a series of missions to help develop technology. The telescope will be operated by the space telescope science institute and will be a key component of NASA's Origins programme, helping to answer key questions about the nature of the Universe, including its creation, physics, chemistry and potential biology, and to find out whether there are other Earth-like planets. NGST will be able to observe first-generation stars and galaxies and individual stars in nearby galaxies, and to penetrate dust clouds and discover thousands of objects in the Edgeworth-Kuiper Belt. 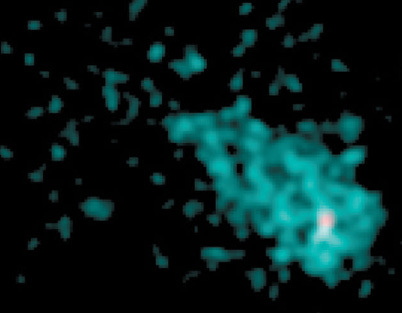 N galaxy galaxy designation introduced by William W. morgan to indicate a system whose light is dominated by a bright unresolved nucleus. N galaxies may be quasistellar objects, bl lacertae objects, radio galaxies or extreme seyfert galaxies. As the quality of images and other supporting data has improved, this classification is now mostly found in a historical context. Nicholson, Seth Barnes (1891-1963) American astronomer who spent his entire career at Mount Wilson noctilucent cloud These beautiful high clouds can only be observed from between 50° and 65° north or south. This is because they do not occur closer to the equator and during summer, when they occur, twilight is too bright. NORMA (gen. normae, abbr. nor) Small, inconspicuous southern constellation, representing a surveyor's level, between Lupus and Ara. It was named Norma et Regula (the Level and Square) by Lacaille in the 18th century. It brightest star, y Nor, is a naked-eye double, with bluish-white components, mags. 4.0 and 5.0; e Nor is a wide binary with components of mags. 4.8 and 7.5, separation 23". Norma's brightest deep-sky object is NGC 6087, an open cluster of about 40 stars between mags. 6 and 10. Observatory, specializing in the planets, asteroids and comets. Nicholson discovered four faint satellites of Jupiter, and used a thermocouple device to measure the temperatures of the Sun, Moon, planets and stars. He calculated an accurate temperature for sunspots, showing that they were cooler than the surrounding photosphere, and for the solar corona, showing that its 2 million K temperature was much hotter than the layers of the Sun's atmosphere immediately below it. Nicholson's precise measurements of the temperatures of giant stars in the solar neighbourhood allowed the first good estimates of those stars' true diameters. Nicol prism Optical device used to polarize plane light and to analyse polarized light. Invented in 1828 by William Nicol (1768-1851), the prism consists of two pieces of calcite or Iceland Spar cemented together using Canada Balsam. When light enters the prism it undergoes double refraction, that is, the light is split into an ordinary ray and an extraordinary ray, each having the opposite polarization to the other. The ordinary ray is reflected at the Canada Balsam surface, while the extraordinary ray passes straight through. Thus any light beam can be split into its two polarized components. Astronomers use Nicol prisms to measure the degree of polarization present in light from the object under study. nitrogen (symbol N) Element that in order of cosmic abundance is fifth by number of atoms and seventh in terms of the mass content of the Universe (see astrochemistry). Its properties include: atomic number 7; atomic mass of the naturally element 14.0067 amu; melting point 73.3 K; boiling point 77.4 K. It was discovered in 1772 by the Scottish chemist Daniel Rutherford (1749-1819), although several other chemists were close behind. Nitrogen has seven isotopes, ranging from nitrogen-12 to nitrogen-18; two of these are stable and form the naturally occurring element (nitrogen-14, 99.6%, nitrogen-15, 0.4%). Nitrogen comprises 78.08% by volume of dry terrestrial air (75.52% by mass). Under normal terrestrial conditions, it exists as a colourless, odourless gas formed of the diatomic molecule, N2, and is chemically unreactive because the bond between each pair of atoms is hard to break. It is also contained in a wide range of compounds, including ammonia (NH3), and is an important constituent of many organic molecules and foodstuffs for living organisms. Atomic and ionized nitrogen are produced in the upper atmosphere by the action of solar radiation; they react with oxygen and ozone to produce nitric oxide. Sudden enhancements of atomic and ionized nitrogen, resulting from the impact of energetic particles from solar flares, can therefore result in significant temporary depletions of the terrestrial ozone layer. Apart from the Earth, the only Solar System body to possess a nitrogen-rich atmosphere is titan, the giant satellite of saturn. Nitrogen makes up 94% by volume of Titan's atmosphere. Nitrogen plays an important catalytic role in the carbon-nitrogen-oxygen cycle, which is the major helium-producing nuclear reaction in stars more massive than the Sun. A variant of the carbon-nitrogen-oxygen cycle known as the CNO bi-cycle involves the capture of further protons to produce nitrogen and helium as end products, and this process may have produced a large fraction of the cosmic abundance of nitrogen-14. Liquid nitrogen is widely employed to cool sensitive astronomical detectors in order to reduce unwanted background noise. Nobeyama Radio Observatory Facility of the national astronomical observatory of japan located at Nagano in central Japan. It operates the Nobeyama Radio Telescope, a 45-m (148-ft) millimetre-wave instrument equipped with a 25-beam focal plane camera. It gravitational force, sometimes described as a 'rocket effect', has undoubtedly contributed to difficulties in accurately predicting the movements of some comets, including 109P/SWIFT-TUTTLE and 23P/BRORSEN-METCALF. Nordic Optical Telescope Pioneering 2.6-m (102-in.) optical/infrared telescope located at the ROQUE DE LOS MUCHACHOS OBSERVATORY. It is operated by the Nordic Optical Telescope Scientific Association (NOTSA), whose member states are Norway, Sweden, Denmark, Finland and Iceland. Completed in 1989, the telescope was the first large instrument to have a dome equipped with ventilating doors to improve local atmospheric turbulence. ACTIVE OPTICS provide high-resolution imaging. A North America Nebula NGC 7000 was discovered by William Herschel in 1786. It is a complex of absorption, emission and reflection nebulae. North America Nebula (NGC 7000) Large, roughly triangular EMISSION NEBULA in Cygnus (RA 20h 58m.8 dec. +44°20'). It covers an area of about 120'X 100'. Under good conditions, the object is visible to the naked eye as an enhancement of the Milky Way east of Deneb. Long-exposure images show intruding dark nebulosity, which gives it a striking resemblance to the continent of North America, complete with the Gulf of Mexico. The dark nebulosity separates NGC 7000 from the PELICAN NEBULA to the west. The North America Nebula lies at a distance of 3000 l.y. Northern Coalsack Region of dark nebulosity, which obscures the Milky Way in Cygnus, south-east of Deneb and 7. It marks the start of the Cygnus Rift, which splits the northern Milky Way into two branches. The Northern Coalsack has an apparent diameter of about 5° and is centred on RA 20h 40m dec. +42° also operates a millimetre array with six 10-m (33-ft) antennae. Nobeyama contributes to both the VLBI Space Observatory Programme (VSOP) and the ATACAMA LARGE MILLIMETRE ARRAY. noctilucent cloud Pearly white or silver-blue clouds formed during the summer months at high latitudes in either hemisphere. They are found in thin sheets at altitudes around 82 km (51 mi), close to the mesopause. The clouds are very tenuous, only becoming visible by contrast with the twilit sky when the Sun lies between 6° and 16° below the horizon. In addition to their colour and 'night-shining' nature, noctilucent clouds are distinguished by their highly banded wave structure. In the northern hemisphere, they are most often seen in late June and early July. Noctilucent clouds are believed to consist of water ice condensed on to small solid nuclei, probably of meteoric origin. The frequency and brightness of displays appears to have shown a secular increase since the 1950s. Northern Cross Popular name for the shape formed by the main stars of the constellation CYGNUS. Deneb (a Cygni) marks the top of the cross, with Albireo (P Cygni) at its foot. The crossbar is formed by 8, 7 and e Cygni. north polar distance Angular distance of a celestial object from the north celestial pole, measured along a great circle. Polar distance is the complement of DECLINATION, the sum of an object's polar distance and its declination always being 90°. North Polar Sequence List of 96 stars near the north celestial pole, ranging in magnitude from 2 to 20. The PHOTOGRAPHIC MAGNITUDES have been accurately measured and are used for comparison purposes. nova The shells of gas around the recurrent nova T Pyxidis have been shown by the Hubble Space Telescope to consist of blobs rather than smooth rings. This is thought to be because material from successive explosions, travelling at different speeds, is colliding. nova The light-curve of a nova typically shows a steep rise in brightness by a factor of many thousands followed by a slow, irregular, decline. The rapid rise in brightness is caused by thermonuclear runaway – explosive hydrogen burning on the surface of the white dwarf component of the binary pair. non-baryonic matter Matter that does not exhibit BARYON characteristics. non-gravitational force Any force that is not gravitational acting on a celestial body, in particular a force that produces effects similar to gravity. The activity of gas jets emerging from a comet's NUCLEUS around the time of perihelion may cause acceleration or deceleration, leading to changes in a comet's orbital period. This nonnormally with an amplitude of 11-12 magnitudes. Nova Cygni 1975 (V1500 Cyg) had the exceptionally large amplitude of 19 magnitudes. The subsequent decline is much slower. Two subtypes are recognized on the basis of the time taken to fall 3 magnitudes from maximum: fast novae (NA) take less than 100 days; slow novae (NB) take 150 days or more. A further subtype (NC) shows both a slow rise (sometimes as long as a decade) and an extremely slow decline. The appearance of a bright star-like point of light in the sky over only a few nights of observation, at a position where previously no star had been known, was a matter of great interest in ancient times. The phenomenon tended to be ignored by European chroniclers during the Middle Ages because the prevailing culture belief was that the heavens represented a perfect and therefore unchangeable creation by God. When change did in fact occur in the sky the matter was dealt with by ensuring that no written record of it was made. When astronomers today are concerned to know about what happened a thousand years ago they consult the records of cultures other than the European, notably of the Chinese (see CHINESE ASTRONOMY). The appearance of TYCHO'SSTAR and KEPLER'SSTAR (both actually SUPERNOVAE) in 1572 and 1604, respectively, were seminal events in bringing about a complete change in the European conception of the heavens. Because astronomers nowadays have photographic plates of the whole sky on which even exceedingly faint stars may be seen, it is often possible to locate a nova's precursor. An even greater amount of information may be obtained by following the spectral features of a nova through its sudden outburst into its decline over a time interval of weeks and months. The outcome of such investigations is that novae are in the main, if not indeed wholly, WHITE DWARF stars that happen to be members of BINARY STAR systems, more specifically, that they are interacting binaries. Novae may be observed in galaxies other than our own, and attempts have been made to use such observations as an indicator of the distances of other nearby galaxies. The great majority of observed cases are within our own Galaxy, where for the limited region of the solar neighbourhood they are found to occur at a rate of about two per year. The solar neighbourhood is determined by the fogging effect of INTERSTELLAR DUST, which cuts down the range of effective observation to about 5% of the whole Galaxy, for which the rate of occurrence of novae is estimated to be about 40 per year. Our subjective perception of a nova is confined to light in the visual and photographic ranges of wavelength, omitting the ultraviolet. Because the ultraviolet is of variable importance, probably being of greater importance before outburst than during it, our subjective perception tends to exaggerate the contrast between the pre-nova state and the maximum emission of light during the outburst. The observed contrast for visible light is usually about 10,000 to 1, but if all wavelengths were included the contrast would probably be about 100 to 1. The emission of visible light in the pre-nova stars is of a similar order to the emission from the Sun, whereas the emission at maximum outburst is of a similar order to that of a supergiant star of type F8, of which Wezen, the fourth-brightest star in the constellation of Canis Major is an example. A typical nova rises to its maximum in a few days, and declines thereafter in brightness by a factor of about 10 in 40 days, although cases of both slower and more rapid declines are known and studied. Clouds of gas are ejected at high speeds during outbursts, speeds typically of about 1500 km/s (930 mi/s), which is more than sufficient for the expelled gases to become entirely lost into interstellar space, together with myriad fine dust particles that condense within the gases as they cool during their outwards motion. The total amount of material thus lost is estimated to be about one part in ten thousand of the total mass of the parent white dwarf star, although the amount in especially violent cases is almost certainly appreciably larger than this. Much thought has been given in recent years to the cause of novae. The consensus of opinion is that the basic mechanism of the explosion of a nova is the same as for the explosion of a thermonuclear weapon. To begin with, energy is produced at a comparatively gentle rate by NUCLEAR REACTIONS in material that is covered (tamped) by a layer of relatively inactive other material. Because of the tamping material, the energy produced by nuclear reactions cannot escape and accumulates within the reacting material itself. Provided the tamping effect is strong enough, the rising temperature and pressure cannot be alleviated by expansion, causing the nuclear reactions to become progressively more violent. The same cycle of events is repeated with the energy released from the nuclear reactions, and it accelerates at an ever-increasing rate, until eventually the situation gets out of hand (in a 'thermonuclear runaway'), or until the tamping effect of the overlying material fails, and the material is expelled from the strong gravitational field of the white dwarf. Depending on the mass of the white dwarf, its chemical composition, and the amounts of the reactions and tamping materials, the details of explosion may vary in ways that are subject to mathematical calculation, and which have been found to agree with many of the observed features of novae. Novae are now considered to be like other forms of cataclysmic variable in consisting of an interacting binary system. The secondary component is a class K or M giant, subgiant or dwarf star, which transfers matter on to the white-dwarf primary. Unlike certain supernovae, the outbursts do not disrupt the system, although material is expelled into space, and it is generally accepted that the system settles down into a POST-NOVA stage. Mass transfer is later resumed and after a long interval a second nova outburst may occur. The recurrence time is related to the mass of the white dwarf and (with reasonable assumptions about the mass-transfer rate) is of the order of 30,000 years for a white dwarf of 1.3 solar masses, and one million years for a white dwarf of 0.6 solar mass. Certain stars that apparently resemble novae are known to undergo explosions repeatedly, for example T Coronae appeared as a low-amplitude nova in 1866 and 1946, with two smaller outbursts in 1963 and 1975, while T Pyxidis did so in 1890, 1902, 1922, 1944 and 1966. Although it was once thought that these systems (see RECURRENT NOVA) might represent a stage following a principal nova outburst, this now appears unlikely, because of their different physical characteristics. The circumstances in which the nuclear reactions in a nova occur, especially if a supply of protons is available for mixing with carbon and oxygen, lead to the production of some nuclides that are not synthesized by nuclear processes occurring towards the centres of stars. Examples are 15N and 26A1. It is also possible that neutrons produced by reactions of alpha particles with 13C participate in a form of RPROCESS, in which very heavy neutron-rich nuclei are synthesized. Condensing solid grains in the gases expelled by novae may be expected to contain such unusual nuclides. In particular, outbursts on CNeMg (carbon-neon-magnesium) white dwarfs produce various nuclei, including the radioactive species 22Na and 26Al. Novae now appear to make a substantial contribution (together with supernovae and red giants) to the abundance of such isotopes in the interstellar medium. When the Solar System formed from interstellar material, some grains derived from novae would be present. The presence of 22Ne and 26Mg (the daughter products of 22Na and 26Al, respectively) in meteorites indicates that the protosolar nebula did indeed contain species from one or all of these sources. The total energy of explosion of a typical nova has been estimated at 1045 ergs, which is about as much energy as the Sun emits in 10,000 years. It has been suggested that novae might be precursors for Type I super-novae. Spectroscopic evidence, however, indicates that some of the material from the white dwarf is lost at each outburst. This suggests that despite the accretion of material and the production of certain heavier elements in the outburst, the overall mass of the white dwarf is unlikely to increase sufficiently for it to reach the chan-drasekhar limit. nova-like variable (NL) variable star subtype, a form of cataclysmic variable. Nova-like variables are poorly known. 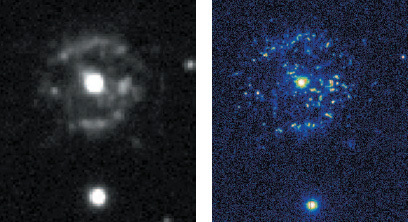 Their general characteristics (particularly changes in light and spectra) resemble those of a nova or post-nova rather than a dwarf nova or symbiotic star. Some show nova-like outbursts, but others have never displayed such activity. Once an object of this type is studied in detail it is normally possible to assign it to a more specific cataclysmic type. Nozomi Japan's first mars explorer. Nozomi was launched in 1998 July and was propelled towards a rendezvous with Mars in 2004 by a series of gravity-assisted lunar flybys. It will be placed into a low orbit around Mars, with the primary objective of studying the planet's upper atmosphere with emphasis on its interaction with the solar wind. Nozomi will measure the Martian magnetic field for the first time, investigate the ionosphere, take images of the weather and the moons, phobos and deimos, especially to confirm if there is a dust ring along the orbit of Phobos. N star Member of a class of cool carbon stars. Class N, part of the original Harvard system of spectral classification, was introduced to describe red stars that lack the class M absorption bands of TiO, and instead have strong absorptions produced by carbon compounds, particularly C2, CN and CH. Class N second-ascent giants (asymptotic giant branch stars and some Miras) divide into subclasses N0 to N9, whose temperatures roughly track those of the M giants (3600 to 2000 K). The class, along with the warmer rstars, has been subsumed into class C, with subtypes of roughly C6-C9. nuclear reactions Interactions between atomic nuclei or between atomic nuclei and subatomic particles or gamma rays. Nuclear reactions produce transformations from one element or isotope to another. There are two basic types of reaction, fusion and fission. The main astronomical occurrences of fusion are within stellar interiors, novae and during the early stages of the big bang, resulting in the build-up of elements up to iron from lighter nuclei. In stellar interiors and in supernovae absorption of protons and neutrons by nuclei builds up elements heavier than iron. The fusion reactions build elements of heavier mass number from the lighter. The first of these, thermonuclear fusion, is the process that created most of the helium in the Universe in the first few minutes after the Big Bang; it provides the main energy output of the stars, and indeed it governs stellar evolution. It also provides the energy released in hydrogen bombs; and it may eventually be harnessed for power generation in fusion reactors. The main astronomical occurrences of fission are within novae and supernovae, where very short wavelength gamma rays cause nuclei between about sulphur and iron to disintegrate to lighter nuclei (photo-disintegration). In addition, in the interstellar medium cosmic ray impacts fragment carbon, nitrogen and oxygen nuclei to lithium, beryllium and boron (see spallation). Fission accounts for the production of some elements and isotopes that are not produced by other processes. It is also involved in many radioactive decay processes, and is the basis of current nuclear energy generation and atom bombs. See also astrochemistry; binding energy; carbon-nitrogen-oxygen cycle; nucleosynthesis; pprocess; proton-proton reaction; rprocess; sprocessing energy per nucleon however is a maximum for iron, and so the formation of heavier elements requires more energy to be supplied than is produced. The elements above iron are therefore thought to be formed during supernova explosions by the successive addition of neutrons (the rprocess) and protons (the pprocess), with the energy of the explosion fuelling the reactions. nucleosynthesis Process whereby helium and the heavy elements are created from hydrogen. There are four main areas involved in nucleosynthesis: the early stages of the big bang; the energy-generating reactions inside stars; reactions during nova and supernova explosions; and cosmic ray collisions within the interstellar medium. The first nucleosynthesis reactions to be identified were the proton-proton reaction and the carbon-nitrogen-oxygen cycle. Both of these were suggested in 1938 as sources for the energy of the Sun, the former by Hans bethe, and the latter, independently of each other, by Bethe and Carl von weizsacker. The processes both convert hydrogen into helium-4, the proton-proton reaction being most important for stars with masses up to that of the Sun and the carbon-nitrogen-oxygen cycle becoming dominant within more massive stars. In 1956 and 1957 Geoffrey and Margaret burbidge, William fowler and Sir Fred hoyle identified most of the remaining reactions inside stars that synthesise the elements up to iron, though only the most massive stars are able to follow the whole sequence. The next stage after helium formation is not the production of beryllium-8, because that decays back to two helium-4 nuclei (a-parti-cles) in 2 X 10~16 s, but it is the triple-a process producing carbon-12. The triple-a process involves two helium nuclei combining and then a third being added before the beryllium-8 can decay. It requires a temperature of about 108 K before it will start since the nuclear reactions involved are slightly endothermic (requiring the supply of energy) and therefore need the input of thermal energy to get them to occur. The triple-a process overall is exothermic: more energy is released by the process than is used in starting it, because the carbon-12 nucleus that is the result of the reaction is in an excited state and emits a high-energy gamma ray. nucleus, galactic At X-ray wavelengths the nucleus of the Milky Way shows hundreds of white dwarf and neutron stars, together with black holes, surrounded by incandescent gas at a temperature of 10 million K. The bright white patch in the centre of the image is the site of the supermassive black hole at the heart of the galaxy. nucleus NASA's Deep Space 1 imaged the inactive nucleus of Comet Borrelly from 3417 km (2123 mi). The bright patches on the surface of the 8-km (5-mi) long body are thought to be the source of the material that forms a cometary coma when heated by the Sun. Although helium-4 is produced within stars, its abundance at about 25% by mass (see astrochemistry) throughout the Universe is far too high to be accounted for in this way. It is therefore thought that most of the helium-4, along with hydrogen-2 (deuterium), helium-3 and lithium-7, was generated during the early stages of the Big Bang. At a time a few seconds after the start of the Big Bang, the numbers of protons and neutrons would be in the ratio of about 87% to 13%. The abundance ratio of protons to neutrons is largely independent of the exact conditions in the Big Bang. This is because, in equilibrium, the ratio is determined by the balance between the number of protons and electrons combining to form neutrons and neutrinos and the number of neutrons and neutrinos combining to form protons and electrons, and this depends only upon the reaction rates. About 100 seconds after the Big Bang , the temperature would have fallen sufficiently for deuterium to form and to be stable. All the available neutrons would then quickly combine with protons to produce deuterium, and the deuterium would build up to helium-4. Since the 13% of the mass of the Universe in the form of neutrons combines with 13% in the form of protons during this process, the final amount of helium-4 produced this way is about 26%, which is convincingly close to the observed 24.9%. nucleus Central part of an atom, containing most of the mass of the atom and formed from protons and neutrons. The nucleus has a density of about 2.3 X 1017 kg/m3 and is a few times 10~15 m across. nucleus Small solid body containing the main mass of a comet. Comet nuclei are comprised of icy, volatile material with an admixture of dust, surrounded by a dark outer crust. They are mechanically fragile, and many have been observed to undergo catastrophic disintegration when close to the Sun. Comet nuclei range in size from the relatively tiny bodies (only tens of metres in diameter) detected in large numbers by the SOHO coronagraphs, through to kilometre-sized objects, and up to much larger icy planetesimals. Among this last category, asteroid 2060 chiron (also given a periodic comet designation of 95P/Chiron) is thought by many astronomers to be a giant cometary nucleus, c.180 km (c.110 mi) in diameter, which will in some tens of thousands of years enter the inner Solar System and fragment to spawn a new group of short-period comets on similar orbits. nucleus, galactic Central region of a galaxy, meaning a region from a few thousand light-years in size down to the small volume of an active galactic nucleus. This is the region of greatest density of stars and gas and least angular momentum in a galaxy, where massive objects may be formed. Bursts of star formation as well as accretion on to massive black holes can generate enormous amounts of energy. Nunki The star Sagittarii, visual mag. 2.05, distance 224 l.y., spectral type B2.5 V. The name is of Babylonian origin, but its meaning is not known. nutation Small, cyclical oscillation superimposed upon the 25,800-year precession of the Earth's rotational axis, caused by the combined gravitational effects of the Sun and the Moon. Discovered by James bradley in 1747, nutation produces a slight 'nodding' of the Earth's axis; it changes with the continually varying relative positions of the Sun, Moon and Earth. Lunar nutation, which is caused by the 5° inclination of the Moon's orbit to the ecliptic, causes a variation of 9" on either side of the mean position, in a period of 18 years 220 days. Solar nutation has a period of 0.5 of a tropical year. Fortnightly nutation has a period of 15 days.